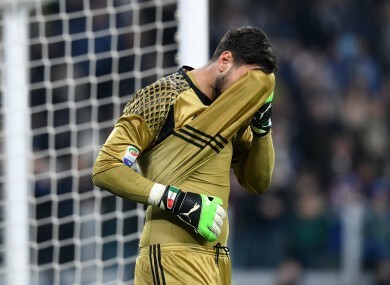 NEWS THAT MILAN’S teenage goalkeeper Gianluigi Donnarumma does not wish to sign a new contract has not gone down well with the club’s supporters. The 18-year-old has been the Rossoneri’s number one since October 2015 and while his age has attracted inevitable headlines, there is no doubting his ability and he is rightfully regarded as a top-class keeper. His lack of loyalty to the team that gave him his big break has come in for plenty of criticism but it reached new levels on Sunday when he appeared for the national side in their Under-21 European Championship clash with Denmark. The game was interrupted when Milan supporters behind Donnarumma’s goal threw fake dollar bills at him – covering his goalmouth – and unveiled a banner which read ‘Dollarumma’. Donnarumma’s agent – Mino Raiola – has been at the centre of the stand-off and the strategy will have worked if his client ends up on a lucrative contract with one of Europe’s elite teams. However, until that happens, Donnarumma can expect a lot more of this kind of treatment. Email “Italy game interrupted after angry Milan fans throw money at Gianluigi Donnarumma ”. Feedback on “Italy game interrupted after angry Milan fans throw money at Gianluigi Donnarumma ”.